Corpus Christi City Hall is located at 1201 Leopard Street, Corpus Christi, TX 78401; phone: 361-826-3220. Photo: This was a merchant's residence of the early 1900s. Born in Indianola, Julius Lichtenstein (1871-1923) was three when his family moved to Corpus Christi and opened a drygoods store in 1874. From childhood, he worked in the store that in time became the noted M. Lichtenstein & Sons, a prestigious business relied upon in south Texas. Several Weil family members also joined the firm, and in 1902 Julius Lichtenstein married Carrie Weil (1877-1958). After the death in 1904 of his father, Moritz Lichtenstein, Julius was head of the firm. His duties frequently sent him on visits to the east, where he apparently acquired a liking for architecture that contrasted with the Victorian forms usually seen in this region. Julius and Carrie Lichtestein built this house in 1905 at 715 North Chaparral. The style is Colonial Revival, in a trend popularized by architect Stanford White of New York. Elegant as this structure was — with its stately front door, elliptical porch, peaked roof and other handsome features — the Lichtensteins built and moved into a larger house in 1913, owning this place, however, until 1926. Moved nine blocks north in 1929 (to 1617 North Chaparral Street), this structure, survivor of many fads, stands as an exhibit of a distinctive housing style. 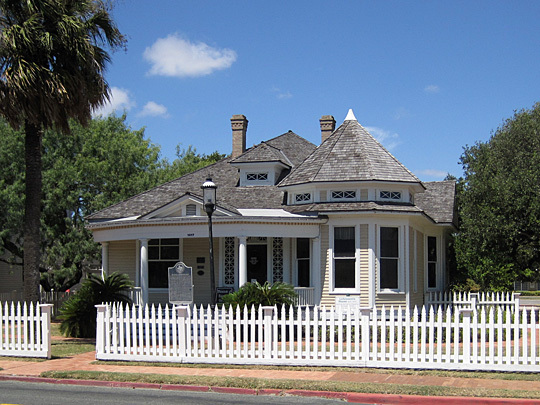 [Texas Historic Marker] Listed on the National Register of Historic Places in 1983. Designated a National Historic Landmark in 1976. Photographed by User:25or6to4 (own work), 2011, [cc-by-3.0 (creativecommons.org/licenses/by/3.0)], via Wikimedia Commons, accessed October, 2012. Corpus Christi overlooks Corpus Christi Bay, sheltered from the Gulf of Mexico by Mustang Island, and is a maritime resort and shipping center visited by the trade fleets of the world, and an all-the-year playground. The city is divided into three distinct areas—the playground, the maritime-commercial, and the residential. The beach is the playground, with piers, bath houses, tourist lodges, hotels, restaurants, lunch stands, and trailer camps lining a graceful, half-moon shoreline. Between the water front and the bluff lines lies the business district, and still farther back, overlooking the entire scene, is the residential section, sweeping away to the south and west. In its citizenry the Spanish influence is mingled with that of the Texas range, the traditions of the South with those of the North, forming a population composite in mode of thought and habit of living. The historical background of Corpus Christi is that of a lusty frontier seaport which, from the time of earliest exploration, knew high adventure. Its name was taken from that given the bay by the Spaniard Alonso Alvarez de Pineda, who, in 1519, claimed the outer island and the land beyond for his king. Other explorers traveling by land and sea, visited the vicinity of the present city during the two centuries following. Although Spanish settlements were attempted in the region of the Bay of Corpus Christi, isolation from Spanish presidios and the constant menace of cannibalistic Karankawa and other tribes of Indians, prevented their development. There were, however, Spanish ranch men whose great estates and fortified houses were like those of feudal lords. Legend has it that Jean Lafitte, notorious Gulf pirate, holed up in Corpus Christi sometime between 1817 and 1821, and in the wake of this tale follow stories of buried treasure in the dunes of Mustang and Padre Islands. No treasure, other than a few old coins, has ever been found. In search of a land and a life that would erase the memory of a broken romance, Colonel Henry L. Kinney left Pennsylvania and arrived to found the present city of Corpus Christi in 1839. A dynamic, aggressive man, he established Kinney's Trading Post, well fortified with walls of shell-cement. The landlocked harbor made snug refuge for contraband cargoes. During this time the region adjacent to Corpus Christi was a no-man's land, claimed by Texas and Mexico. Old documents show that in the Corpus Christi area, Mexican laws were in force and Mexican grants operative until the United States won conclusive victory over the southern republic. As the Mexican War threatened, General Zachary Taylor came, bringing United States troops in small boats across the bay on August 1, 1845. He found a village dominated by Kinney, who was all-powerful on that shore. It was a great day for Kinney's Trading Post. Colonel E. A. Hitchcock, Taylor's chief of staff, said in his memoirs that, "the officers and command of General Taylor's army fraternized with the citizens, social affairs were many, and the town grew rapidly as the flood of army gold brought about the establishment of new enterprises." Another member of the expedition described Kinney's Trading Post as "the most murderous, thieving, God-forsaken hole in the Lone Star ... or out of it." Hitchcock referred to it as a "small village of smugglers and lawless men with but few women and no ladies." Kinney's retort was, "Ladies are all right, I reckon, but I've never seen one yet that was worth a damn as a cook!" The troops increased to approximately 5,000, and in March, 1846, Taylor began his historic march to Mexico, leaving Kinney's Trading Post depopulated and forlorn. The resourceful Kinney began a real estate promotion in 1848, advertising his little sun-baked town of shacks as "the Italy of America." Colonizers were importing settlers for the unpopulated lands south and west, and boatloads of immigrants arrived; many of the newcomers remained in the small port town and started building a better community. A little later a "good will trip" was staged by Kinney and his associates, who sent a large wagon train to open trade with El Paso and Chihauhua. This started a spectacular period of wagon commerce between Corpus Christi and Mexico and with inland points. The armed wagon trains transported everything from onions to gold and silver. Shortly before this time the name, Kinney's Post, had been changed to Corpus Christi; "something more definite for a postmark on letters" was needed. The gold seekers of 1849 used Corpus Christi as a assembling point on the Southern Immigrant Route. In August, 1862, a Federal fleet of two small boats established a land base on the outlying islands. Surrender of the town was demanded on August 14 and refusal brought a bombardment on August 16, which was repeated on August 18. Tradition relates that part of the shells that fell during the attack were loaded with whiskey. Captain Kittredge of the Federal forces missed a barrel of Bourbon and it developed that some of his men had emptied the charges from the shells and substituted whiskey. There was no way to change the shells before the bombardment without revealing the theft. A servant in Corpus Christi accidentally discovered that "whisky bombs" were falling, and thereafter all was merry wherever they fell. A Mexican raid in 1875 furnished the basis of a feud between local settlers and Mexicans of the brush country southwest of the town, a situation lasting many months. Corpus Christi, however, was maturing. A railroad was started. Shipping over a shallow canal increased. Commercial fishing and the export of seafood were added to growing enterprises. The resort advantages of Corpus Christi and the coast around it drew attention. Agriculture gained in importance. On the level black lands back of the town, cotton won ascendancy. Between 1875 and 1885 Corpus Christi was one of the largest wool markets in America. The ranch men, including Captain Richard King, whose holdings lay in the vicinity, turned to sheep for revenue, one ranch having 40,000 head. When the free range disappeared, following the introduction of wire fences, this industry vanished, and was replaced by herds of Hereford cattle. For half a century Corpus Christi enjoyed a hardy development. Not even a destructive hurricane in 1919 deterred increasing growth. Indeed, it stimulated progress by calling attention to the safety of the high bluff section and hastened Federal aid for an adequate port. Tall office structures and hotels were built on the beach and on the bluff. In 1913 a gas well of tremendous pressure "blew out" at White Point, six miles across the bay. Catching fire, it lighted the area for many miles and before choking itself off, created a deep pit in the earth. Explorations continued, and in 1923 the city drilled its first gas well about four miles west of Corpus Christi, and natural fuel was piped into the city for general use. In 1930, oil in commercial quantities was discovered in the same area, and Texas and Eastern capital became interested. The Port of Corpus Christi, made possible by a Federal appropriation and bonds voted by the city and Nueces County in 1922, was opened September 14, 1926. The channel from the Gulf to the turning basin is 21 miles long, with a 200 foot bottom width. Freight steamer service to Atlantic, Pacific, and Gulf coastal points, and to foreign countries, is offered by companies with agencies in the city. South of the port entrance, for nearly two miles to the foot of Craig Avenue, the city in 1940 was erecting a 15-foot concrete sea wall in front of the business section. Reinforced with creosoted piling and interlocking steel, the wall will make possible the reclamation of a strip of land, at some points extending as far as 1,000 feet into Corpus Christi Bay. Its purpose is two-fold: beautification of the bay front and protection against storms. In future years broad boulevards, parkways and municipal buildings will be built on the new land, and protected basins for pleasure craft constructed. The plan for this project was first suggested by Gutzon Borglum, sculptor, after the hurricane of 1919. The estimated cost will be between two and three million dollars.